Download this ebook and learn how web experience management can help you reach and keep your customers. Explore why customers leave your website and how to keep them engaged. Customer expectations are higher than ever today, especially on the web. They expect you to know who they are and what device they are on, and to tailor the experience specifically to them. 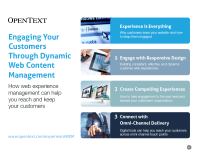 To do that more and more organizations are leveraging content management systems (CMS) and web experience management (WEM) to ensure they are delivering genuine, compelling experiences tailored to their customer’s lifestyles. Organizations are unable to reach and keep customers engaged with their brands on the web for three common reasons, which WEM can help them overcome.